I’m sure we’re not the only ones who are pleased to see that summer has finally arrived in London. Here at The Amazing Blog, we are taking advantage of these sunnier evenings by spending our time in the garden, relaxing with a drink in hand. The girls enjoy a cocktail or two, but I’m a cider man, myself. So when Celtic Marches sent us this Abrahalls Thundering Molly Cider, I was the first to pour myself a glass and venture out onto the patio. One of Thundering Molly’s unique attributes is her retro label. Adorned with a 1950s pin-up, the whole office was a fan of the aesthetically pleasing bottle. The cider itself has a lovely rich, golden hue, which was enough to make my mouth water just looking at it. Celtic Marches describe the brew as a ‘well rounded medium cider’ and it certainly went down smoothly. The sweet sharpness of the apples, made with 100% fresh pressed juice gives a wonderfully refreshing taste. 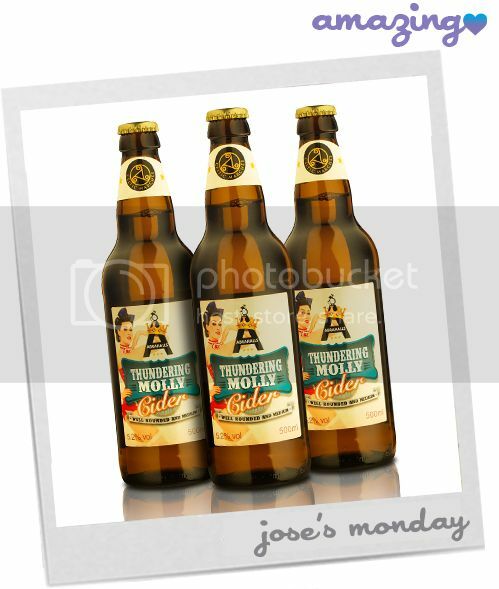 There is something about one of your five-a-day being turned into a delicious alcoholic beverage that I can wholly agree with, and the crew at Abrahalls have definitely become the apple of our eye.